– 0000652: [skin editor] close and don’t save, shows editor after closing (stevenhanna6) – resolved. – 0000651: [client/server] when in mimic mode exit popup shows on server (stevenhanna6) – resolved. – 0000646: [client/server] XNET limited to 10clients ? (stevenhanna6) – resolved. – 0000655: [generic] spider results usually missed last cover found (stevenhanna6) – resolved. – 0000657: [generic] corrupt databases no longer crash xlobby on start, a partial database will be recreated instead (stevenhanna6) – resolved. – 0000656: [generic] cant rename blu ray movies (stevenhanna6) – resolved. – 0000658: [generic] meta change saved at different time (3 hrs of inactivity) or on exit (stevenhanna6) – resolved. – 0000654: [setup] Database Template Crash (stevenhanna6) – resolved. – 0000659: [content playback] stretch 4×3 movies to full screen on new installations (stevenhanna6) – resolved. – 0000660: [content playback] f5 resize tools can be used on 4×3 dvds now (stevenhanna6) – resolved. – 0000663: [content playback] missing content popup warning when content is offline/missing/not found (stevenhanna6) – resolved. The room has finally taken shape. 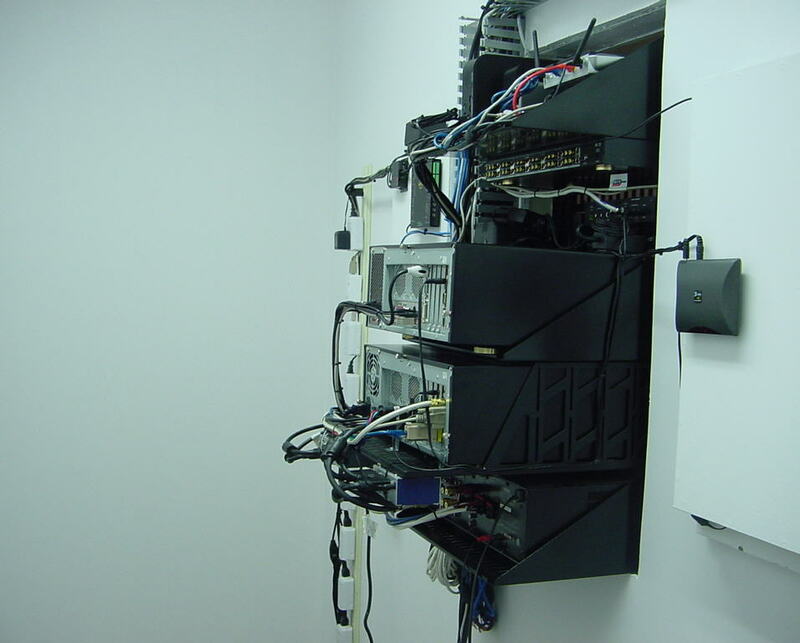 There is still more work to be done but the room is basically ready for training and customer demos. 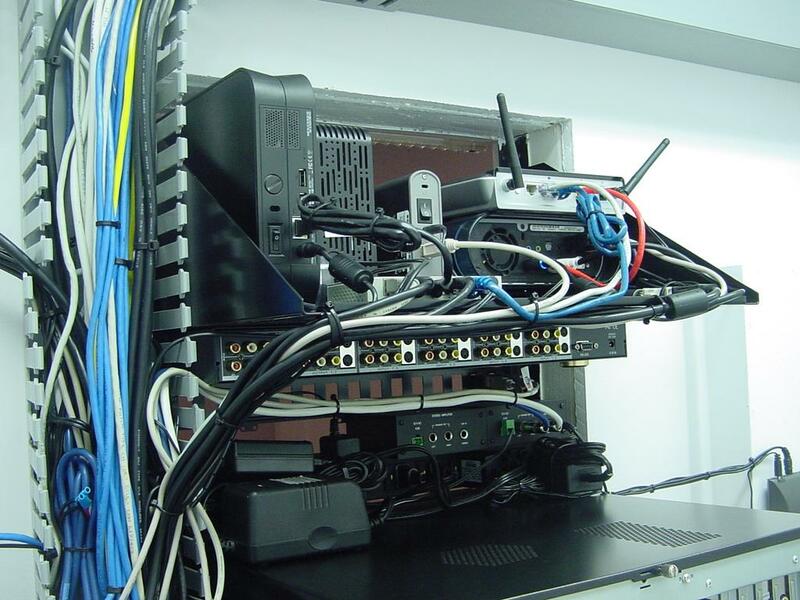 xLobby rack images with wire management cleanup underway. Rear views of (1) xLobby Standard client, (1) xLobby Blu-Ray client, Yamaha stereo receiver, Insteon and UPB modules. 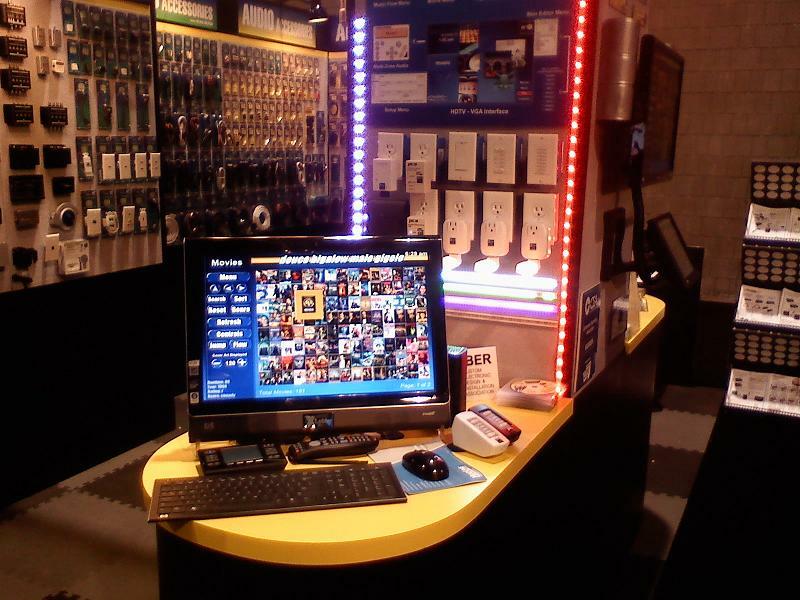 xLobby RF remote receiver for 95-1074TSR, 92-161 IR Distribution, WACI Controller, 40-1071 HDMI Balun. 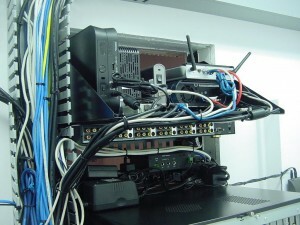 xLobby rack image with Wi-Fi wireless access point, (1) xLobby Mini client, NAS and external USB hard drives. This news post is subject to updates. 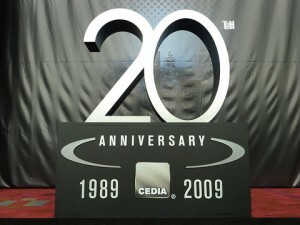 This year marks the 20th anniversary of CEDIA’s founding. 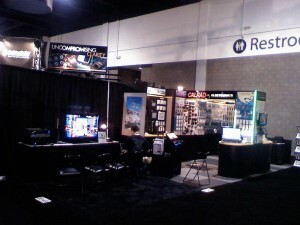 The attendance at Cedia 2009 in Atlanta Georgia was better than I expected but reports from Cedia reported that the show was down about 12 percent, the new venue is huge with more space to grow then denver, some drawbacks to the venu included a maze of escalators and long walkways from halls A, B to C the main entrance. 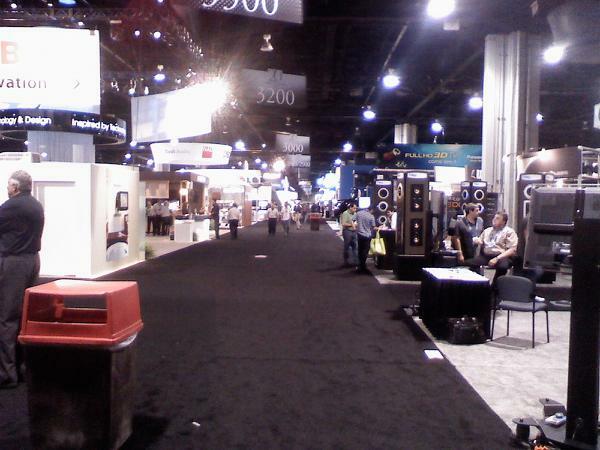 The southern hospitality at the hotels, restraunts and at the convention was truly amazing. 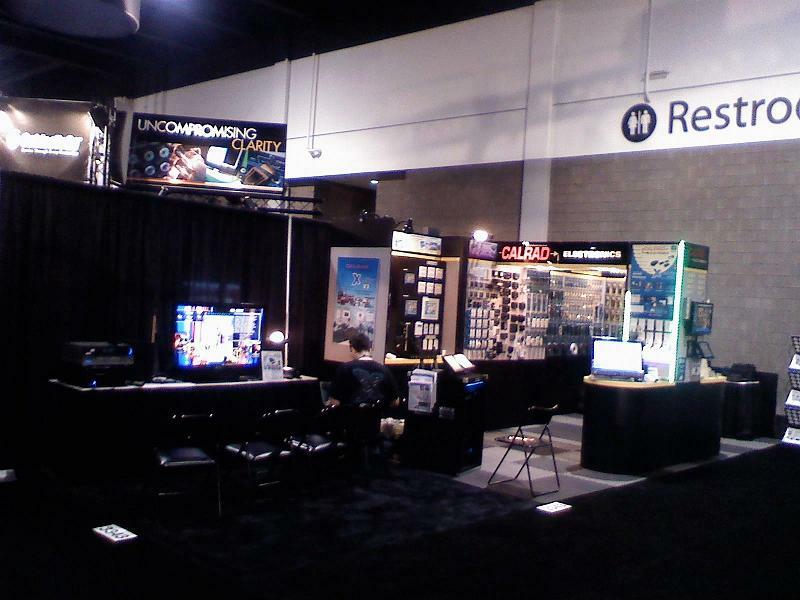 The booth was busy for most of the show except for the last day which is usually filled with brief surges of attendees and then slows down to handful of people. The booth was visited by current xLobby users as well as installers who were new to the xLobby platform. Users were impressed with the power of the skin editor and the in depth resources and tools for installers to use and customize xLobby to fit there needs integrating different products. Image of the xLobby Accessories (WACI), (Global Cache, Russound Keypads and Insteon lighting control area of the Calrad Booth. 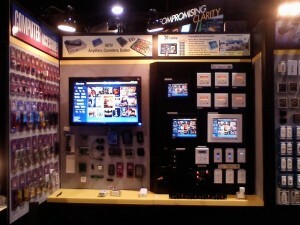 Shot of the Calrad booth, demonstrations of xLobby V3 with Bluray DVD management and playback. 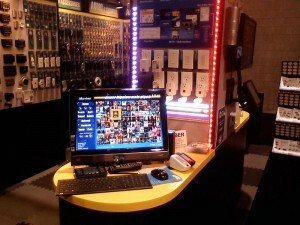 Calrad Booth with xLobby UPB controled L.E.D lighting and HP touchsmart PC running xLobby software. Calrad would like to thank all of our existing customers and new attendees for stopping by our booth and spending time with us, we are looking forward to seeing you again in 2010. This news post will be updated over the next few days. xLobby can communicate with virtually any lighting protocol on the planet but this does not mean some technologies are perfect. Insteon provides a simple and low cost retrofit solution for lighting, users need to understand its limitations and drawbacks, Insteon can have its flaws. It is strongly advised that potential xLobby customers be made aware of some of the issues below, thus adding to the cost and labor required to troubleshoot them. 1. 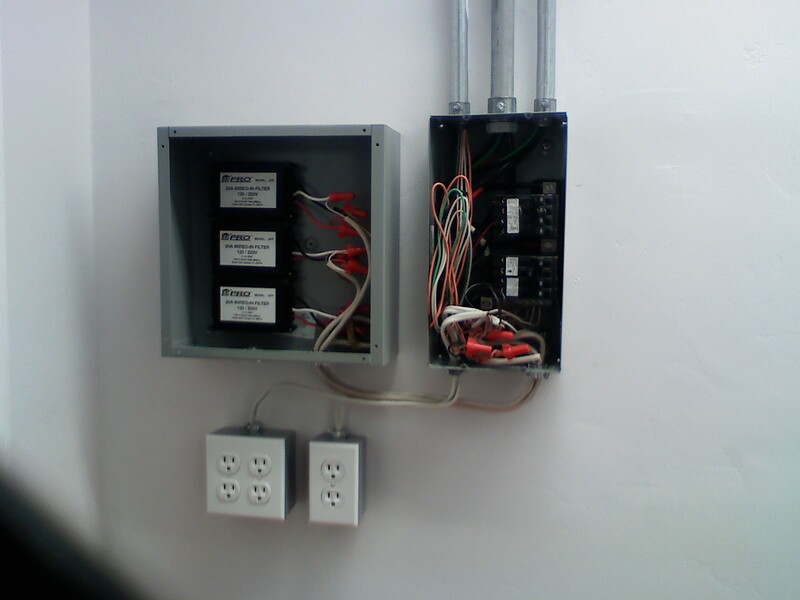 Subjective to new high frequency energy saving lighting ballasts that will require a low pass filter otherwise these type of products can wipe out your complete home automation system. Calrad rescently upgraded hundreds of new energy saving flourescent light fixtures that used new high frequency ballasts, these ballasts emit so much electrical noise that it completely wiped out the communication links between the PLC\PLM to all the insteon products in the xLobby demo room. We had to install several filters in the electrical sub panel to isolate the xLobby room completely from the rest of the buildings. This was the most logical solution otherwise we would of had to install almost over 200 filters at every lighting fixture. Granted this is not the normal lighting setup for the average home owner but as we use more modern products that use high frequency switch mode power supplies the AC electrical noise issues become more prevelant. 2. 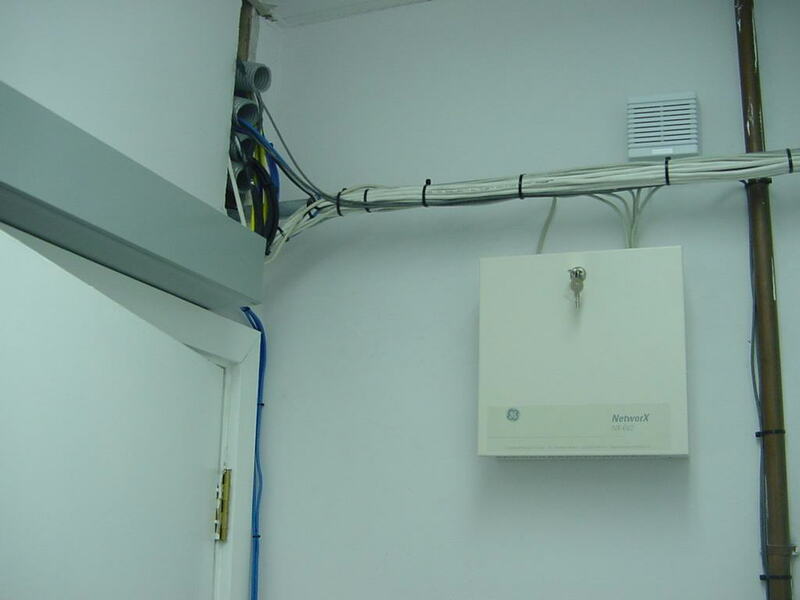 Use of only a few devices can become a challenge and difficult task to setup, if the PLC\PLM are on a different phase then the Insteon wall dimmers or switches it will be difficult for them to communicate withn each other, requiring wired or even wireless phase couplers. 3. 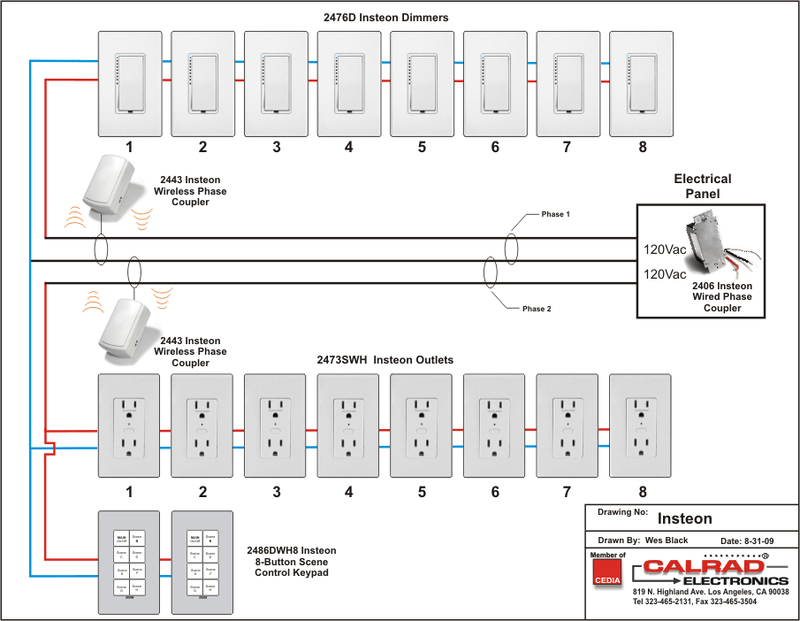 Calrad has spent lots of R & D time to optimize our code to minimze common issues with the insteon hardware and its different protocols. Special features have been added to insure proper updates and polling of the system. 4. Noise on the electrical system is Insteons and other AC carrier based systems worst enemy. 5. 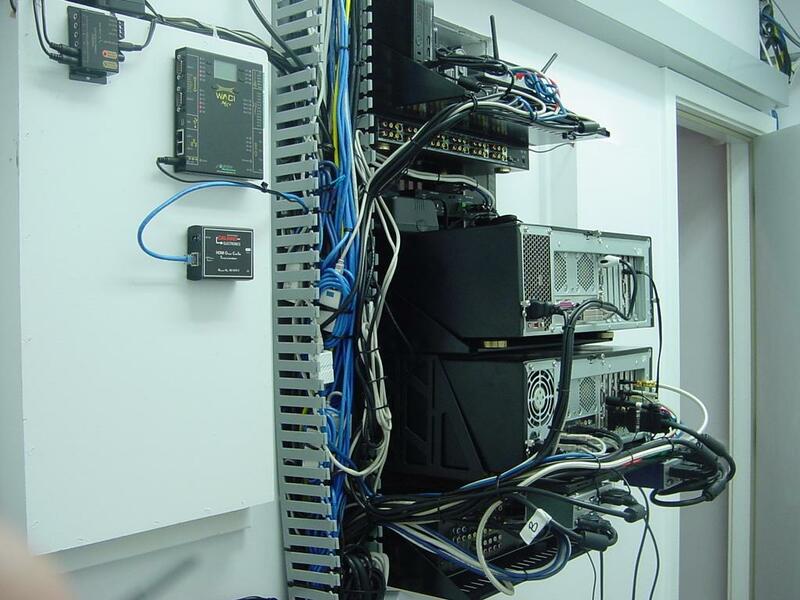 Never Plug a PLC\PLM or other Insteon device into a surge protected outlet strip or a AC- UPS or battery backup system this will definately impede its ability to communicate properly with other insteon products. 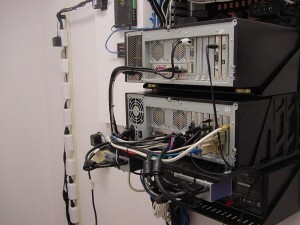 Even computer sitchmode power supplies can cause electrical noise that effects insteon devices. 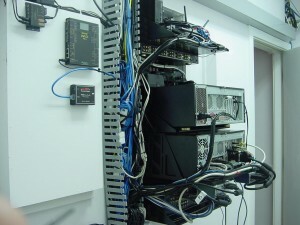 So in some cases its better to use a filtered AC strip for your AV gear and computer or locate the PLC away from the other equipment causing interference. 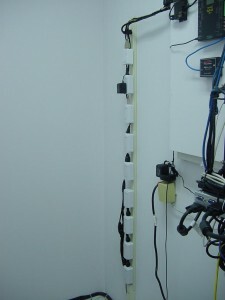 Image of xLobby room sub panel with Low pass filters. xLobby equipment room showing 6 ft. Power strip with 6 x Insteon Appliance modules (2456S3), 1 x PLM (2412M), 1 x wireless access point (2443). UPB 1 x PIM modules. Insteon products have served our xLobby customers well but the technolgy requires careful planning and a good understanding of its limitations compared to other technologies or hard wired lighting control systems. A side note is that when we ran several UPB lighting products in the same room they seemed un-effected by the noise, this does not mean that UPB technology does not have issues with noise or other products that may cause noise in a different frequency range but can offer additional solutions when one technology will not perform. This news post is subject to frequent changes or updates. You are currently browsing the xlobby news blog archives for September, 2009.